When you need an emergency plumber in Houston call Herrera Plumbing Service for help 24 hours a day. 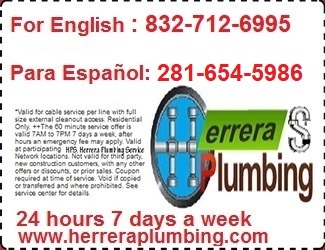 Herrera Plumbing Service is your reliable emergency plumber. Our expert professional plumbing company is amongst the longest established plumbers in Houston Texas. Of course there are other plumbers in Houston, but our 24 hour emergency plumbing service sets us apart from the others. When you need a highly skilled professional plumbing company capable of handling a plumbing emergency quicly and efficiently, you can rely on Herrera Plumbing Service to deliver. Our entire team is committed to minimizing the impact of any emergency plumbing situation upon your home and family. We are on call 24 hours a day and we don't use overnight call centres or hire in casual plumbers to cover out of hours callouts. All emergency plumbing callouts are handled by our regular on-staff plumbers so you can be confident that you will receive the same helpful care and attention whatever the time of day or night. When you call herrera Plumbing Service for help, you can be secure in the knowledge that if the job is larger or more challenging than normal, we will ensure that we provide all the manpower and expertise required. Your personal plumber has 24 access to a licensed Master Plumber and if necessary we can mobilize our entire team of 24 hour emergency plumbers.